Give your visitors an unexpected treat this Easter by making your own stuffed focaccia in the classic Italian style. The smell of baking alone will be worth the extra effort. Buon appetito! 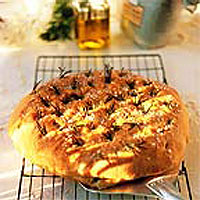 This rich bread recipe, focaccia farcita, comes from the Ligurian region of Italy. It is made with a starter - a loose batter of yeast, flour and water, which is left to ferment for 12-16 hours. It is worth taking the time to do this because the starter gives the bread its wonderfully open, airy texture and distinctive aroma. The filling can be changed to include other vegetables and cheeses (see Cook's tips, below). To make the starter, begin the day before: sprinkle one-third of the yeast (about 2g) into 150ml warm water, add 125g of the flour and mix to a smooth, thick batter. Cover and leave to ferment at room temperature for 12-16 hours, until it has a loose and bubbling consistency. The next day, make the focaccia dough. In a large bowl, mix together the salt, the remaining flour and the dried yeast. Make a well in the centre and pour the olive oil and starter into it, and combine. Gradually add 200ml of warm water and mix to form a soft, sticky dough - add a few more drops of water if the dough seems a little dry, but take care not to use too much or the dough will become too wet and will become difficult to handle. Turn the dough out onto a floured surface and knead for about 10 minutes, until smooth, silky and elastic. Place in a clean, oiled bowl, cover with an oiled plastic bag or clingfilm and leave to rise at room temperature for 1½-2 hours, or until the dough has roughly doubled in size. Knead the dough to return it to its original size, then divide into two. Lightly knead both halves, cover loosely with clingfilm or an oiled plastic bag and leave to rise for 10 minutes. Preheat the oven to 180°C, gas mark 4. Roll out both halves to 30cm rounds on a floured surface. Place one of the rounds on a lightly oiled baking tray. Arrange the mozzarella over the first round, season with sea salt and freshly ground black pepper, then sprinkle with the basil leaves and top with the gorgonzola. Place the second round on top of the filling and gently press the edges together to seal. Cover as above and leave for 25 minutes, or until slightly increased in size. Make indents, for the rosemary, all over the dough with your fingertips. Sprinkle with the sea salt and decorate with rosemary, then drizzle with the olive oil. Bake for 25-30 minutes, or until golden. Transfer to a wire rack to cool. When cool, drizzle with the extra virgin olive oil. You can find Italian Mountain Gorgonzola at the Waitrose cheese service counter. To make the bread in advance, prepare until the end of step 8, cover with clingfilm and chill in the fridge for up to 3 hours. Then remove from the fridge and follow from step 9. To make individual focaccias, follow the recipe to the end of step 5, then divide the dough into 8 rounds and roll each piece out to 15cm diameter. Continue following the recipe and bake for 20-25 minutes, or until golden. Cool and drizzle with the remaining extra virgin olive oil. Makes: 4 focaccias. For an alternative taste, try using 2 x 125g packs Galbani Italian Mozzarella and a 200g tub of Waitrose Grilled Red and Yellow Peppers (from the chiller cabinet), instead. Just slice and arrange the mozzarella and the peppers (reserve the oil) on the rolled dough base, season and scatter with fresh basil leaves. Place the second half of the dough on top and seal gently. Bake as above, then drizzle with olive oil when cooked. When cooled drizzle with the oil from the peppers, garnish with chopped rosemary sprigs and sprinkle with sea salt.